"If only I could tear it down and free myself!" shouted Anatole. "You've got to get a hold of yourself," Francois shot back. "Accept what is!" "I'll never accept it! 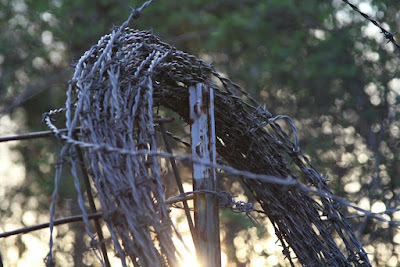 I am tormented by this barbed wire fence all around us!" “How do you stand it, Francois?" Anatole and Francois packed up their gear and climbed into the Francois and Anatole’s Fence Company truck. "Look, Anatole, it's a good fence and the customer was satisfied," said Francois. "You've got to stop being such a perfectionist!" Well, did I fool ya into thinking these guys were some kind of political prisoners in the old Soviet Union, some third world country, or Texas? No? You were onto me all the time? Well, serves me right for not being a perfectionist! If you want to check out the work of the other Friday Fictioneers relative to the picture prompt above, please click here. Every one is a perfectionist in his or her own way but always in a good way. As for Anatole, he is imprisoned not by a fence but by his own mind. And that may be the worst imprisonment of all. That was unexpected good job. Thank you. Want to put up a fence? A real twister there, Perry. Well done. Yeah, I'm about to reel you in. Do you prefer being cooked in butter sauce or straight up? Thanks, Sandra. Happy to fence you in! I agree. I have a perfectionist's nature coupled with a lazy disposition, so I can never be satisfied because I don't work hard enough to be satisfied. Well, maybe I'll beat it in the next life. I can't tell you how many crooked sutures I removed in my surgical career. I'm a perfectionist so I understand. Acceptance is the best defense from the fence. Yep! Shouldn't all doctors be perfectionists? Or at least the ones that work on me? Perfectionism is a curse at times... Good twist, Perry! That's why it takes me so long to write a story. I type a sentence, then tear it apart and reconstruct it over and over. I did the same thing with Lincoln logs. By the time I got the cabin built he'd been assassinated and three more presidents had came and gone.